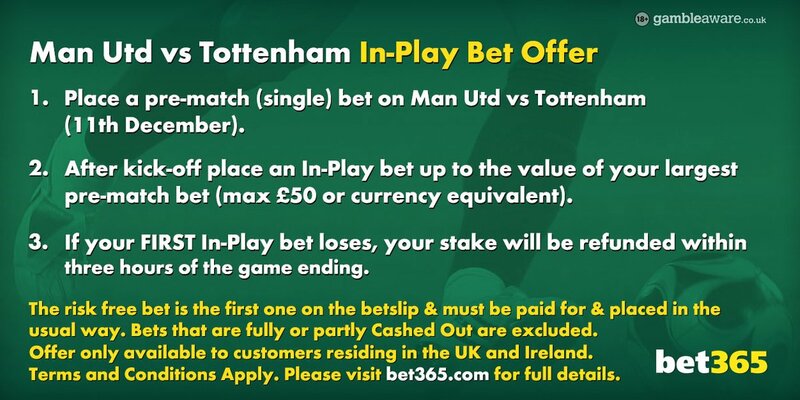 Man UTD host Spurs in a hotly anticipated Super Sunday clash this weekend, and bookmaker bet365 is offering our readers the possibility to claim a risk-free £50 in-play bet on Man UTD v Tottenham match! Find here how to claim it! Both teams are looking to secure Champions League football for the next season. The hosts 9 points off the top 4 heading into the weekend, while Tottenham are only three points below the 4th place Manchester City. Who will win this game? Whatever side you back, you should not miss Bet365 £50 free in-play free bet offer! It's the mot appreciated betting promotion in the industry! Once the game has kicked off, go for a correct score at a bigger price. Eg: 2-1 Manchester UTD at 8/1. This offer applies to bets placed on the Manchester UTD v Tottenham Premier League match, played on Sunday 11th December 2016. Risk free bet value will be equal to the stake of your largest pre-match single bet placed on the Manchester UTD v Tottenham Premier League match, played on Sunday 11th December 2016, up to a maximum of £50*. Pre-match bets that are fully or partly Cashed Out will not qualify for the offer, whether Cashed Out pre-match or In-Play. The largest pre-match bet that has not been fully or partly Cashed Out will qualify (up to £50*). Risk free bet will be deemed your first single bet placed In-Play on the Manchester UTD v Tottenham Premier League match, played on Sunday 11th December 2016. If your first single In-Play bet is fully or partly Cashed Out, you will no longer be eligible to receive this offer. Note that 'pre-match' is defined as bets placed prior to kick-off of the Manchester UTD v Tottenham Premier League match, played on Sunday 11th December 2016 and 'In-Play' is defined as any bet struck after the game has kicked off. 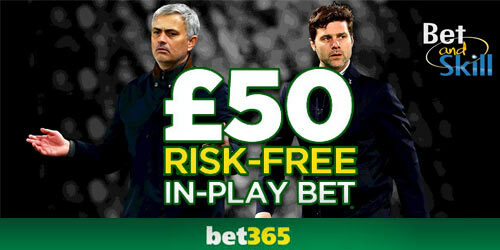 "Man UTD v Tottenham Bet365 £50 free bet in-play (Risk-Free)"